Two rules should govern the management of urologic trauma. First, in the stable patient all efforts should be made to evaluate and address genitourinary injuries at presentation. Imaging of the urinary tract can be easily incorporated into computerized tomography (CT) of the abdomen by obtaining delayed images during the renal excretion phase. This allows complete staging of renal and ureteral injuries. Assessment of bladder injuries should be done with plain film or CT cystogram. Early imaging and expeditious repair of select urologic injuries is essential as delayed management can lead to increased complications (Elliott and McAninch 2003). In fact, even if an injury may eventually heal with conservative management one should consider an operative repair if the patient is being taken to the operating room for repair of another injury (Gomez et al. 2004; Santucci et al. 2004). The first rule is illustrated by two examples. If a patient is being explored by general surgery and a gunshot wound injury of the kidney is discovered that is amenable to renorrhaphy, then a renal repair should be done, as this leads to a decreased incidence of delayed urine leak and blood transfusion (Meng et al. 1999). Likewise, if a patient with a blunt trauma is being observed for a large extraperitoneal bladder rupture and he is taken to the operating room for fixation of an unstable pelvic fracture, then the bladder rupture should be repaired, as it will decrease his recovery and cathe-terization time (Gomez et al. 2004). The second rule is that in the ««stable patient the urologic injuries must be measured alongside other, often more life-threatening, injuries; urologic injuries can often be managed without reconstruction or temporized with a drain (Elliott and McAninch 2003; Gomez et al. 2004; Santucci et al. 2004). This rule is illustrated by the example of a patient with a gunshot wound injury to the central portion of the kidney who is hemodynamically unstable. In this case, a nephrectomy maybe preferable to a complicated reconstruction. 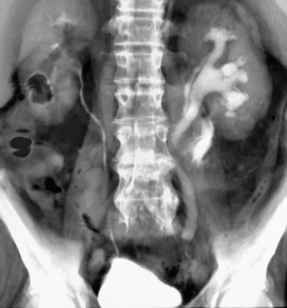 Likewise, in a patient with a ureteral injury who is unstable due to concomitant injuries, the ureteral injury may be temporized with ligation of the ureter and placement of a nephrostomy tube rather than reconstruction of the ureter. For these reasons, it is essential that the urologist have excellent communication with the other services involved in trauma care. Our management of the uro-logic injuries will often need to be modified based on the management plan for concomitant injuries. The management of iatrogenic injury and urologic trauma both demand the perfect balance of vigilance and due caution.